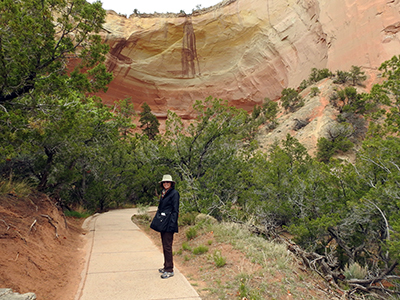 It is our 45th wedding anniversary and Lynda always wanted to take me to Ghost Ranch where Georgia O’Keefe painted, so we went. The flight there was delayed so long by weather that we missed our connection and wound up stuck in Houston over night. 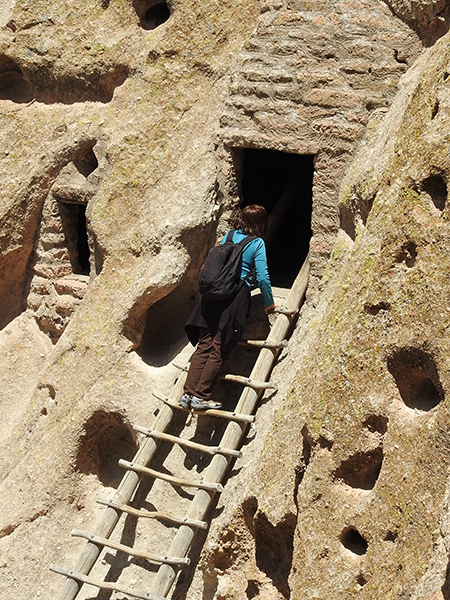 We got there the next day and drove up to Santa Fe, roaming the galleries of Canyon Road in the rain. It must be two miles of art galleries. Then on to the Abiquiu Inn. The Inn was very nice, Lynda wanted me to get acclimated to the altitude in real comfort, before moving on to Ghost Ranch, which she said would be more bijou. 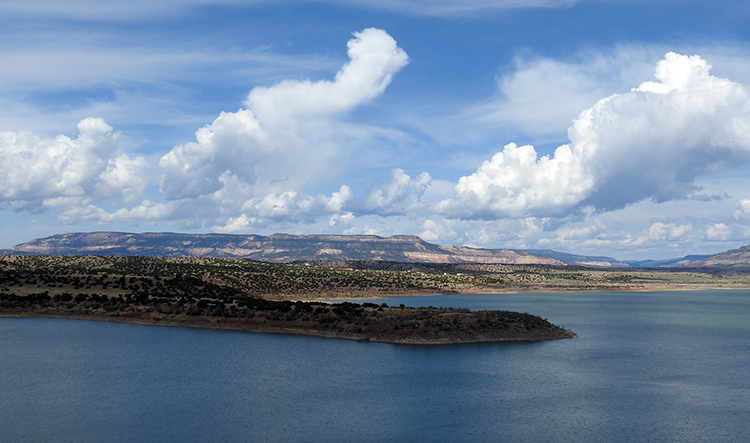 We went out to Bandoleer National Park and Los Alamos one day and Lake Abiquiu the next. I wanted to see the campground at Lake Abiquiu and it looked like a great place to take an RV. The lake was great, right out in the middle of the desert, a popular fishing spot full of trout and bass. Lots of birds, etc. the trail goes all the way around the lake about 15 miles or so. 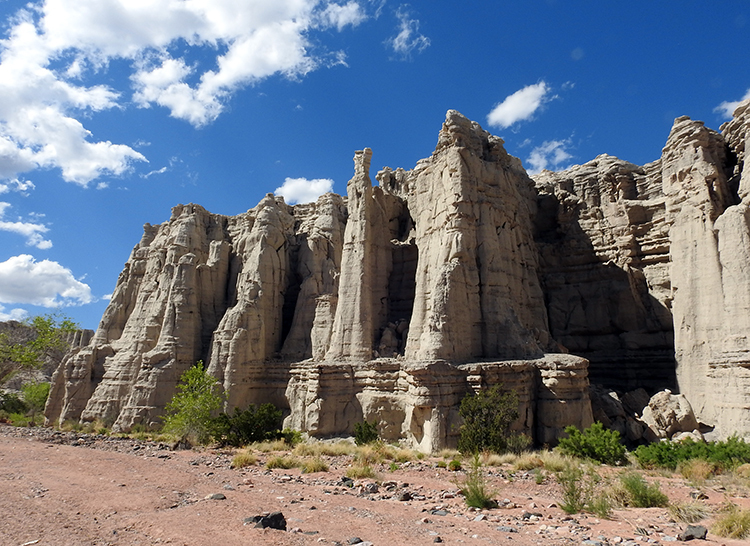 Then on to Ghost Ranch. we went to Echo Canyon first as it is just down the road. You walk about 200 yds. from the parking lot and you are enclosed in a large circular depression in the mesa. You can yell and it will really create an echo back. 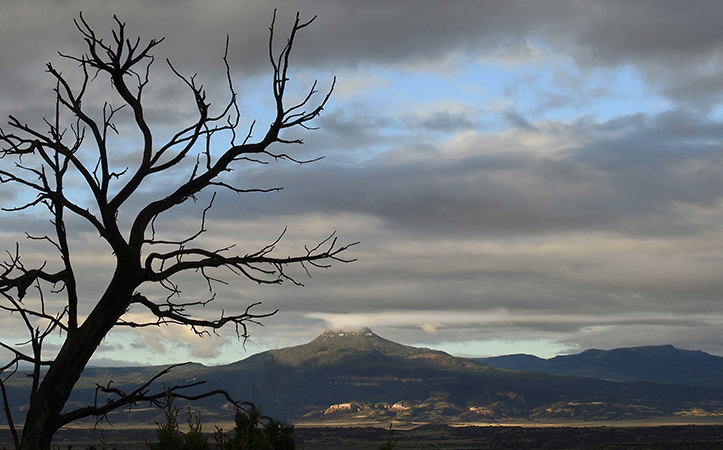 At Ghost Ranch our room was up on top of a mesa, it was called Tumbleweed. It had a bedroom, small living room and a private bath. Lynda said it was really hard to get anything with a private bath. It was about 100 yds. up or down the hill by switch backs to get to the main offices or the chow hall. The amazing thing was that there was a huge common room that had enormous couches, a fire place, and a kitchenette. The views all around were stupendous, the Pedernal, Chimney Rock, Kitchen Mesa, The Box Canyon, everything was right there. 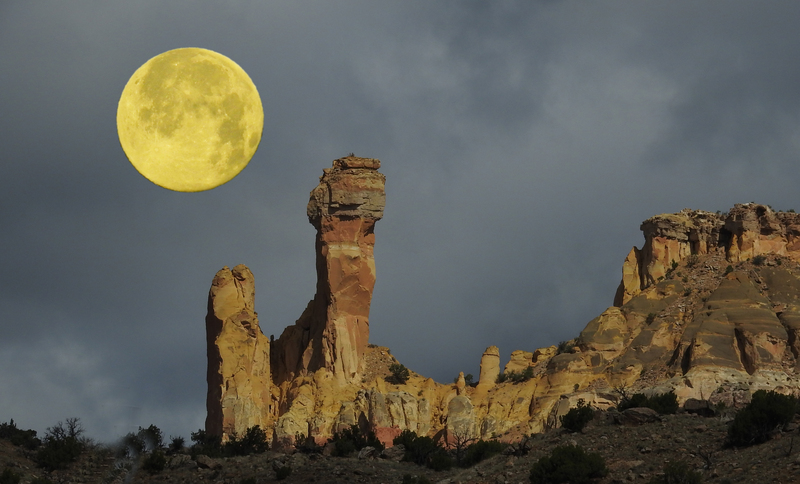 We had a “Blue Moon” one night and I moved it via Photoshop to be by Chimney Rock. We climbed Chimney Rock, you can actually get up on top of the mesa ( just to the right of the photo). The last 100 yards or so is about medium level hiking (not climbing). We hiked out to the red place, box canyon, etc. We also took a photo course from Catherine Anderson. Lynda learned how to take 10X macro shots with her iPhone. And we went out to the “White Place” (Playa Blanca) of Georgia O’Keefe fame. All in all a great trip.